I’ve been making this weeks’ drawing on a piece of calligraphy paper, a long section cut from a wider piece. I had it with me last time I went to Megalo to print so the paper ended up with some monoprints and colour-test marks on it. 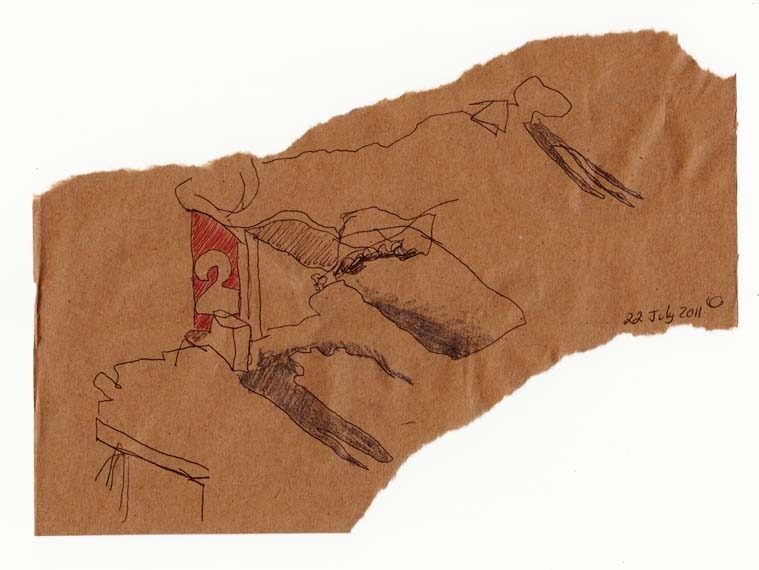 This last piece was drawn on a scrap of paper wrapper I tore off to support the calligraphy paper when I was drawing. 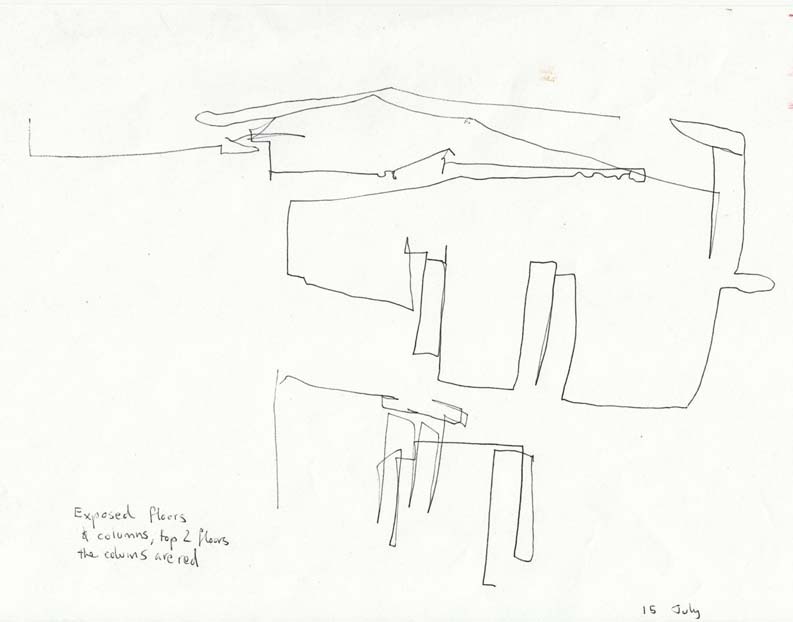 In her recent book Notebooks Betty Churcher says “The act of drawing had me looking more closely.” This book provides access into Churcher’s 2006 trip to key museums around the world (as well as a few earlier drawings), to draw a range of paintings that were important to her and commit them to her memory in the face of her failing eyesight. It is an interesting insight into a range of major paintings that relys on Churcher’s observational skills to understand these works, rather than relying solely on her art historical training. 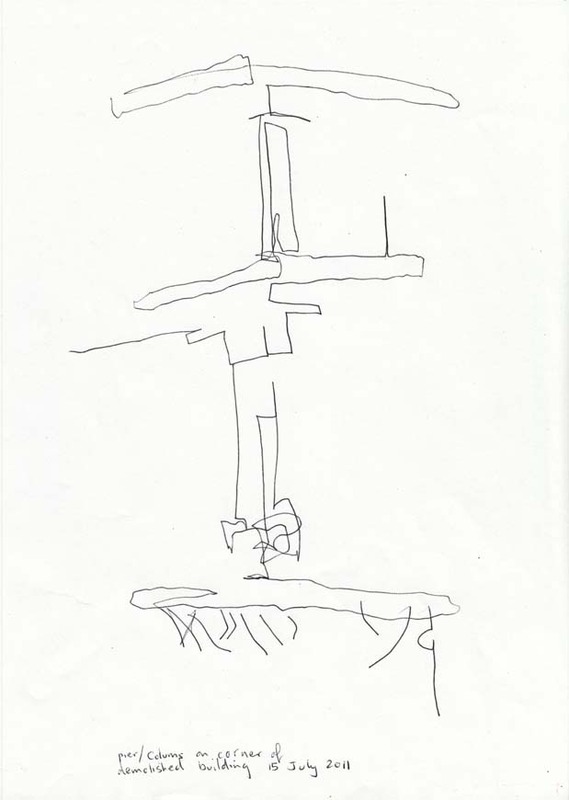 On 13 July I drew these odd lumps of concrete and reinforcing wire poking out above the floor of the building – which is now lower than our own windows. 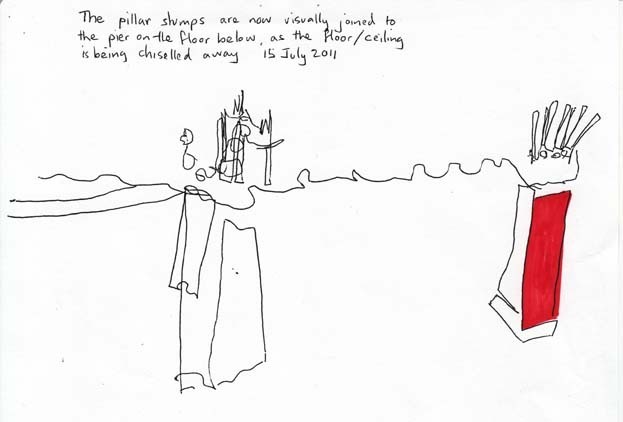 The 15th of July saw quite a few more drawings, including the now visible lower segments of the pillars I had drawn on the 13th. Inspired by Betty’s example and with a sunny lunchtime stretching ahead I went down to street level to try some observational drawing of my own. I ‘warmed up’ by doing a quick blind drawing of the scene. Then to the hard work. I find observational drawing extremely demanding. I have to strive to actually look at what is in front of me. It is easy to be lazy and draw only what I think I see there. 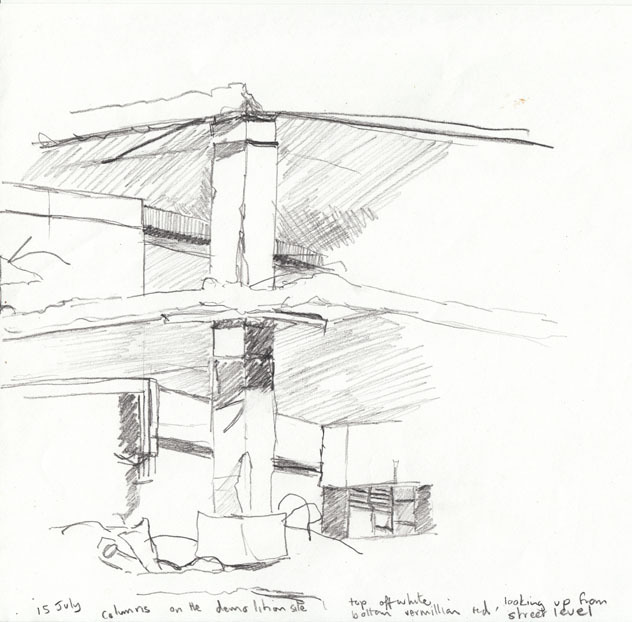 This type of drawing poses a series of questions that you seek to answer with your pencil. How does the angle of the broken floor above relate to the angles of the floor and walls below it? Where does that piece of scrap metal sit in relation As you focus on each of these questions the relationships become clearer and your drawing will truly examine what you are seeing. I really like a good grid. Here is one I spotted late last week. Well I’m playing catch up with my recent drawings. The demolition continues apace. The building is rapidly coming down and is now below our windows opening up great views into the interior. One week after I finished my extended printing sessions at Megalo and I’m still feeling physically exhausted. I need some time and space to gather my thoughts on what I have done. There was lots of energy generated working alongside other printers. The development ideas over a period of weeks was a very powerful experience. 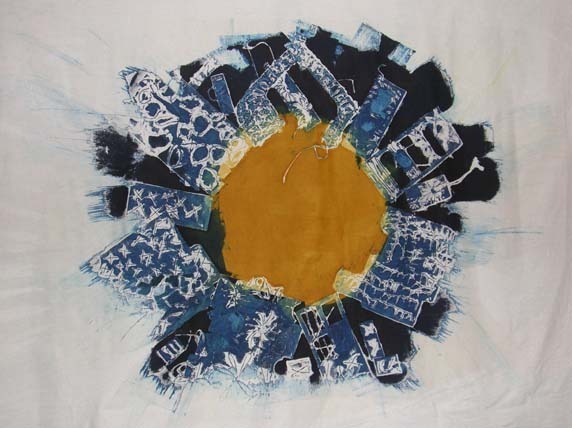 Considering the energy I found it may not be surprising that one of the images that came to me was a burning sun – or maybe that was due to watching Stephen Hawking’s documentary series on over the same period on SBS.